Don't count us out of the flash drive business. That's Seagate's message at the Flash Memory Summit as it shows off another two new SSD products: an 8TB NVMe drive, and a massive 60TB SSD demo in a 3.5-inch form factor. The 60TB shows what's possible if you cram more than a 1,000 Micron 3D NAND dice into a full-size, 3.5-inch disk form factor package. We understand it has dual port 12Gbit/s SAS interface and 150,000 random read IOPS, undisclosed write IOPS (suspect a relatively crap number). The sequential read/write numbers are 1.5 and 1.0GB/sec. The drive has a single controller and we have no information about likely endurance. This would seem to be a precursor of an active (read several / write infrequently) archive SSD or some other application featuring read-intensive, latency-sensitive, high-capacity storage. Just 17 of these suckers would give you slightly over 1PB of capacity. The 60TB is four times larger than Samsung's 15TB 3D NAND SSD, which gives Seagate bragging rights. The Samsung SSD has 512 x 256Gb 48-layer V-NAND chips stacked in 16 layers inside it. Micron's 1100, announced in June, was its first 3D NAND M.2 drive using 384Gbit dice. Our rough math says you'd need 1,250 of them to build a 60TB drive. Seagate's 60TB whopper is also six times larger than its own 10TB 3.5-inch disk drive. We don't know how many times more it costs than the disk and would love to see the $/GB figures for the 60TB SSD and the 10TB HDD. Seagate suggests we could see a 100TB SSD in the future. If a product emerges, Seagate isn't indicating what it might be called. Mike Vildibill, Advanced Technologies and Big Data VP at HPE, offered a canned supporting quote: "Seagate's new 60TB SAS SSD offers an exciting possibility for customers to achieve higher server storage performance and capacity configurations never seen before." Looks like HPE could be signed up to use the thing. The XP7200 is a far, far faster proposition. It has 940,000 and 160,000 random read and write IOPS respectively, while its sequential read and write data rates are 10GB/sec and 3.6GB/sec through its 16‑lane PCIe gen 3 interface. 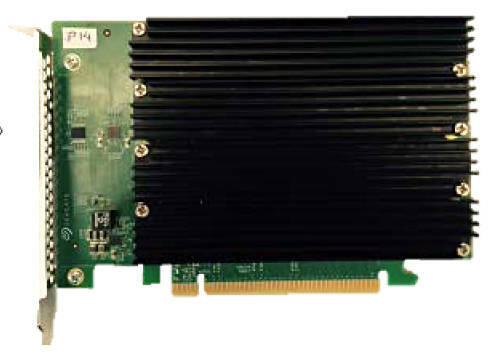 This has a full-height PCIe form factor and has four separate capacity-optimized Nytro XM1440 M.2 SSDs mounted on its base card, each with its own controller. The card fits in a single 16‑lane gen 3 PCIe slot, and you need all the lanes and each drive/controller pair working simultaneously to get the full performance out of it. The available capacities are 3.8TB and 7.7TB and we think MLC flash is used, not the 3D stuff. Seagate demonstrated a 10GB/sec NVMe PCIe gen 3 x 16 product in March at the Open Compute Project Summit. At the time, we wrote: "We expect the new cards to use Micron chips and also, possibly, have Nytro branding." So excuse the smug expression on our faces. Suggested application areas for the XP7200 are high-performance computing, scale-out databases, and big data analytics such as scientific research and weather modelling. Accelstor seems to be building product using the XP7200, judging by a supporting quote in Seagate's release. Seagate says the 8TB Nytro XP7200 NVMe SSD will be available through channel partners by the end of the year. A 60TB SAS SSD product is anticipated for some time in 2017.